Annual Holiday Band Concert to Honor GHHS Graduate Dylan Fitch - Tuesday, December 11, 2018, at 7 p.m. 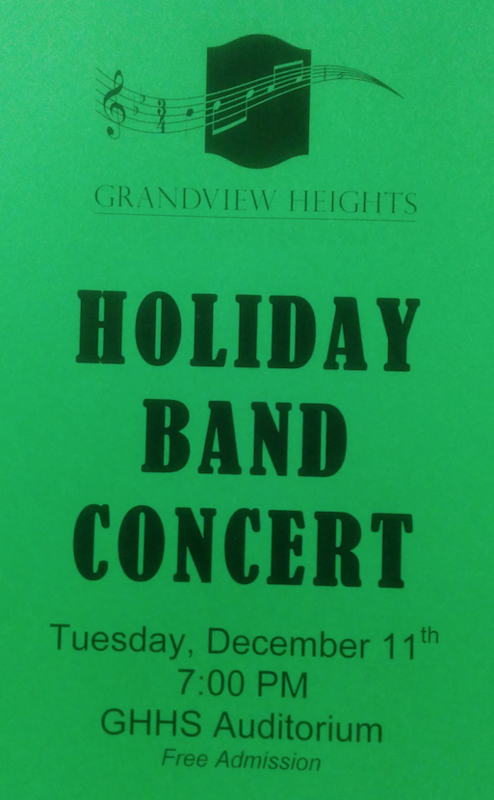 The Grandview Heights High School Holiday Band Concert will be Tuesday, December 11, 2018, at 7 p.m. in the Grandview Heights High School Auditorium located at 1587 West Third Avenue, Columbus. Under the direction of Band Director Chris Herrmann, the band will play holiday favorites in honor of GHHS Class of 2018 graduate Dylan Fitch. Admission is free, open to the public, and street parking is available. As you may know, Grandview Heights High School graduate, Dylan Fitch (2018) was recently diagnosed with Nodular Lymphocyte-Predominant Hodgkin's Lymphoma, a rare form of cancer of the lymphatic system. Dylan and his twin brother, Hunter, were both longtime members of the Grandview Heights Schools bands and his family have been active supporters of the Grandview Heights Schools bands and many other school programs and activities over the years. Dylan is currently taking time off from his studies at OSU to undergo treatment and is at home with his family. The Grandview Heights Band Parents Association, with the support of Mr. Herrmann, Mr. Brown, and the entire Grandview Heights Schools administration, has decided to dedicate the 2018 Holiday Concert to Dylan to help raise funds to support his family during this challenging time. The entire community is invited to attend so please spread the word to your friends and neighbors. The Grandview Heights Schools community is exceptionally good at coming together and supporting our fellow community members and Bobcat families in times of great need and we know this opportunity will be no exception. A box for collections will be provided on the night of the concert. · Cash will be accepted, or checks made payable to "Fitch Family Fund". · All funds gathered at the concert will be delivered directly to Pathways Financial Credit Union, Fitch Family Fund. to assist the family, if you prefer to donate online. · Donations collected at the concert will go directly to assist the Fitch family, and are not tax deductible donations to GHBPA. Thank you, in advance, for your support, and for any assistance that you can provide to our friends Dylan, Hunter, Laura, and Adrian Fitch. We look forward to seeing you at the concert.